We manufacture Leather Biking Suits for your Brand. When it comes to riding, the protection and comfort should be considered to be the prime elements in order to make the journey convenient. Be stylish by wearing the leather biking suits which ensures the protection too. People throughout the world take time to choose the perfect leather biking suits. This leather biking apparel is a wonderful piece to be worn for biking. The leather riding suits are not like the ordinary ones which get damaged with the passage of time. It is manufactured from the good quality Cowhide Leather which ensures high durability and reliability. These stunning and splendid black leather suits are the glamorous and long lasting companion of your riding. These are designed as half zipper jackets so that you can wear it easily within no time. 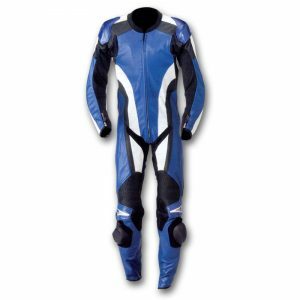 It is quite easy to use this fantastic leather riding suits. The fine finishing and elegant design is ample to make the fashion lover fall in love with these extraordinary leather biking apparel. The combination of biking and leather apparel is trendy. Shopington offers the fantastic styles and designs of these leather suits. Keep your hands on the color, design, and style that you want. The calf pocket is just the heart throb. Now you no need to worry about your size. 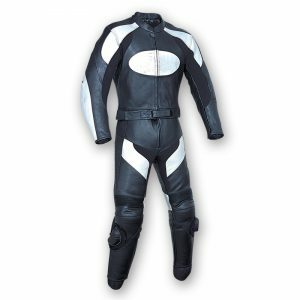 Whatever is your body physique you can wear these amazing leather biking suits because these lovely leather riding suits are available in 7 different sizes. 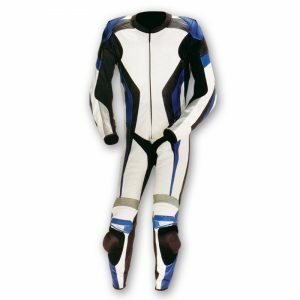 Get your accurate fitting leather biking suit for your store at Shopington. The minimum quantity to be ordered is of 20 suits. Get the 100% customized leather biking apparels in the size which you want from the most famous and well renowned online shop Shopington. It fully covers your body and protects the body from any sort of harm and bad weather. Either it’s a rainy day or a bright hot sunny morning or a cold eve, these leather biking suit will provide you protection in all such situation. It is a water resistant material that does not allow water to enter in your biking suit and give you optimum comfort to ride until you want. It contains protective padding.